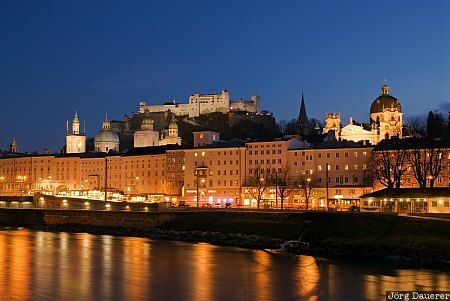 Downtown Salzburg and its floodlit castle "Festung Hohensalzburg" behind the river Salzach at the blue hour just after sunset. Salzburg is the capital of the Austrian state (Bundesland) Salzburg, Austria. This photo was taken in the evening of a sunny day in January of 2008. This photo was taken with a digital camera.